Azerbaijan’s holdings rose 1 ton, the first gain since May 2009, when it held 64 ounces. Azerbaijan held 218 ounces in February 2001 and reported no holdings from March that year to April 2009, the IMF data show. LOL, considérant l'énormité de la rente pétrolière et celle, non moins pharaonique de la rente gazière dont le pays jouit depuis des années, je pensais à une faute de frappe...64 onces au lieu de 64 tonnes, ou, au moins, 64.000 onces...mais là, ça me troue le Q... Quels cons ! It bought a total of 30 tonnes total in 2012. Last July it bought 14 tonnes when gold prices were around this level. 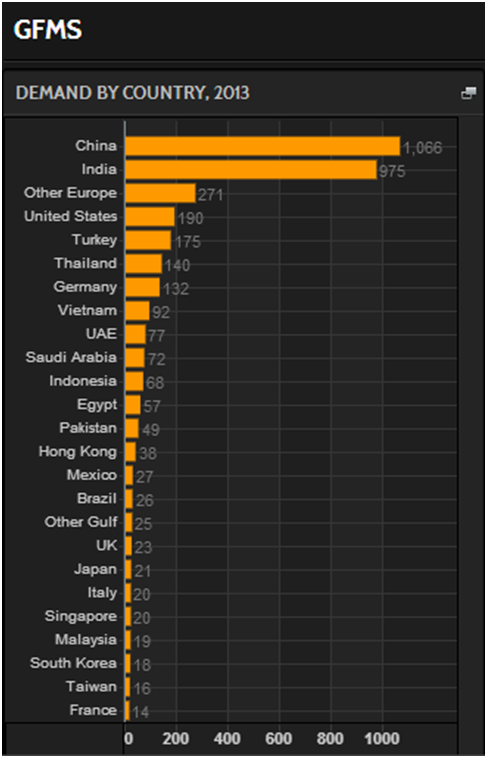 It's clear the eastern hemisphere physical buyers are buying all the gold the west will sell them at this level. It's only a matter of time before the physical demand pushes this market a lot higher. in 2012, International Monetary Fund data show. straight quarter, according to council data. le Mexique, le Danemarque et le Canada en ont vendu, mais en très petites quantités . Technical analysts say that gold's break above $1,400 an ounce on Monday for the first time since June 7, in conjunction with its break above the 100 day moving average and a bullish "cup and handle" chart pattern, suggest more gains are in store for gold which may have bottomed out two months ago on June 28. France, Russia and Turkey were among 15 central banks who added gold to their foreign exchange reserves in July, IMF data showed today. Russia expanded their gold reserves for a 10th straight month in July. Russian holdings, the seventh-largest by country, gained another 6.3 metric tons to 1,002.8 tons. Kazakhstan’s reserves also rose for a 10th straight month to 1.1 tons to about 132 tonnes. Azerbaijan added 2.009 tonnes to bring its holdings to 10.023 tonnes in July. 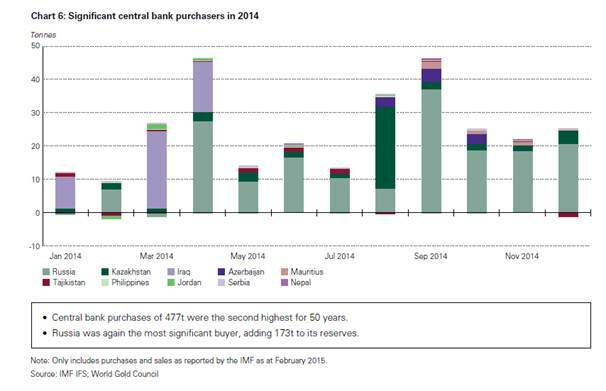 Turkey lifted its gold holdings by 22.5 tonnes, the biggest increase seen among 15 central banks. Turkey now has the world's 11th-largest gold reserves as its holdings rose to 464 tonnes in July from 441.5 tonnes in June. The country's central bank last year allowed commercial banks to hold a portion of their lira reserves in gold. France bought 1,000 troy ounces of gold. The Bank of France has made a few such purchases in recent months. Analysts are unsure as to why the French central bank bought the gold but it may have been due to a Bank of France gold coin offering. Mozambique, Guatemala, Kyrgyz Republic, Kazakhstan and Azerbaijan were some of the other countries who diversified into bullion. Mexico, Denmark and Canada were among those that sold some gold in small quantities. Mexico reduced its holdings for a 15th month to 123.8 tons, according to the data. Russia and Kazakhstan expanded their gold reserves for an 11th straight month in August as bullion prices rallied. Mexico reduced its holdings. Russian assets gained 12.7 metric tons to 1,015.5 tons, International Monetary Fund data showed today. Kazakhstan’s reserves rose 2.5 tons to 134.5 tons and Turkey added 23.4 tons to 487.4 tons, the data showed. Azerbaijan : fond pétrolier de l'état achètera 30 tonnes d'or pour 2013, et 10 tonnes en 2014. Russia has increased its gold holdings by 7.247 tonnes to 1,042 tonnes in February. Turkey and Kazakhstan also raised their bullion reserves, data from the International Monetary Fund showed today. Turkey's gold holdings rose 9.292 tonnes to 497.869 tonnes, the data showed. la BC du Kazakhstan achète 24.7 tonnes d'or en Aout, celle de la Russie en achète 7.23 tonnes. Oct 28 (Reuters) - Russia increased its gold reserves for a sixth straight month in September, while Azerbaijan added to its holdings for a second month, according to International Monetary Fund data released on Tuesday. Russia, which has one of the world's largest gold reserves, added 37 tonnes to its reserves last month, taking the total to 1,149 tonnes, while Azerbaijan raised its reserves by 4 tonnes, taking the total to 27 tonnes. Kazakhstan raised its gold holdings by 2.1 tonnes to 184 tonnes, while Turkey added 12 tonnes taking the total to 532 tonnes. plus forte augmentation depuis 35 ans ! décidément les eurosceptiques se rejoignent : la Hongrie a décuplé ses réserves d'or. Ils partaient certes de très bas, avec seulement 3,1 t. Ils viennent d'y ajouter 28,4 t.
Désormais l'or représente 4,4% des réserves de leur banque centrale, ce qui est la moyenne des pays d'Europe de l'Est. Merci cher contributeur, j'ai vu votre message au moment où je m’apprêtais à poster le lien de la vidéo qui, justement, commente l'article en question en en soulignant les passages les plus importants. La Chine vient d'annoncer une petite hausse de ses réserves en or (+700 000 onces soit près de 22 tonnes). A mon avis, il y en aura d'autres dans les mois à venir, comme fin 2015-début 2016. Tout dépendra de l'évolution de l'économie chinoise et des discussions avec les USA.